All work with no fun makes us dull and uninteresting ... This is more than just a saying. Games are meant to entertain but the best of games also serve another function. They improve our skills and our capabilities, whether they improve our coordination, our math skills or our linguistics skills. Or are important. But just developing our skills is not fun. We require something that will pleasure us, make us feel fun, at the time we're playing it otherwise it will just become homework and we KNOW that's no fun. So, in order to be fun a game must be challenging with a gradually increasing difficulty. We require it be entertaining and be simple to operate. Time With Words seems to have everything pat down. It is a simple word guessing game where the user is presented with a hidden word and then has to guess what it is. Every few seconds another letter from the word is revealed and the total score for the word is decreased. 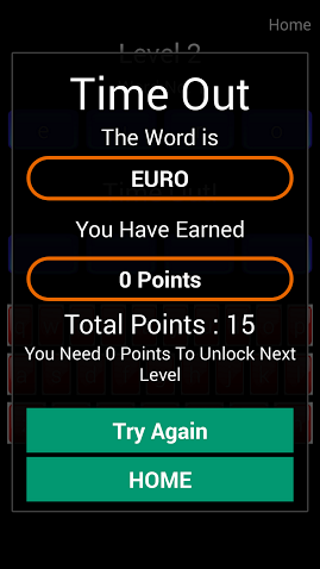 After reaching enough points, the next level with even harder words is made available. Time With Words has several things going for it. First of all, it is very easy to operate and quick to run. There are no complex menus to operate and many options to select. The player just has to open the app and start playing, which makes it ideal for those with just a few spare moments here and there who want to relax. The gradual increase in difficulty in the game makes it easy for everyone to pass the few first levels relatively fast while giving the players a warm up time to get their skills in shape before the more difficult words arrive. 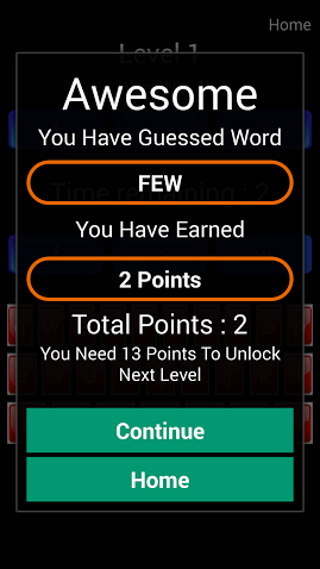 Even with the more difficult words, the game gives the player a few seconds before it reveals a letter, giving everyone a fair chance to guess the word. To sum things up, Time With Words is a simple, quick to play yet quite challenging word finding game. 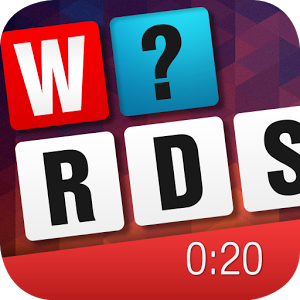 With simple yet satisfying graphics and a large word database with several difficulty levels, Time With Words is the ideal game for those who have a few moments to play now and then, want to have fun and brush up on their linguistic skills.